August is not only the peak season for Malta’s tourism – much like Italy’s ‘ferragosto’ half of Malta appears to be on holiday as well. It being the hottest month of the year, the work rate naturally slows down too and some outlets (factories in particular) will be on shut down for a week or two. A lot of Maltese travel out of the country at this time and a host of others descend on the neighbouring island of Gozo for that home-from-home holiday. But in the searing heat in many towns and villages there are armies of volunteers putting up street decorations while others will be in fields setting up elaborate fireworks – because above all August is the peak of the festa season in Malta with no less than twenty nine of them celebrated during the month. Here we take a look at a few of the major ones. The month starts off with a literal bang as the small village of Lija celebrates the feast of Our Saviour on the 6th. While the feast day sees one of the more solemn processions on the island the real crowd puller is the renowned fireworks show which takes place on the eve of the feast day. Crowds will gather on the edges of the village – others find a vantage point on the hill leading to Naxxar which provides a grandstand view of proceedings. The 7th sees the feast of Saint Gaetan in Hamrun. Hamrun is a populous township in the inner harbour area and lacks open spaces so fireworks have never been a feature here. But the Hamrunizi more than make up for this with a weeklong festival of band marches – culminating in Sunday morning’s huge ‘Marc tal-Briju’ (loose translation – revelry march). This is the day all Hamrunizi descend on the town’s High Street and make merry like no other place on the island and it’s arguably Malta’s largest and loudest street party. Mad and utterly unmissable if you’re on the island at this time! The 15th of the month sees a total of eight feasts celebrating the Assumption of Our Lady – it is also a National Day in Malta. The day has historical as well as religious connotations. In August 1942 Malta had been blockaded for two years and blitzed by successive Luftwaffe attacks –supplies were almost exhausted and Malta was facing possible starvation and capitulation. Operation Pedestal – a relief convoy of 14 merchant vessels escorted by two battleships, three aircraft carriers, seven cruisers, 32 destroyers and seven submarines –had set out on the 3rd of the month and ran a gauntlet of attacks after passing through the Straits of Gibraltar on the 9th. Only five supply vessels made it to Malta – most famously the tanker Ohio which limped half sunk into Grand Harbour on the morning of the 15th. No wonder then that the convoy is remembered in the collective Maltese memory as the Santa Maria Convoy. Santa Maria is celebrated in Attard, Birkirkara, Gudja, Ghaxaq, Mosta, Mqabba, Qrendi and Victoria in Gozo. 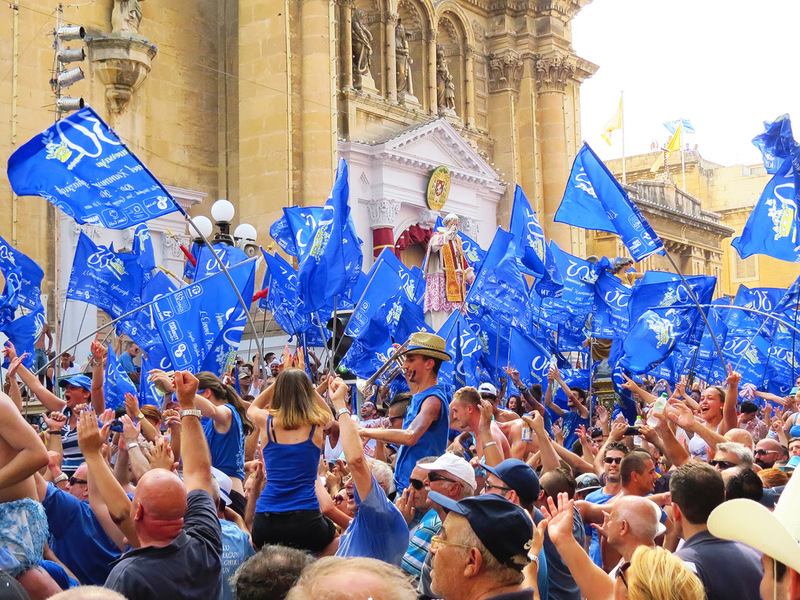 Arguably the greatest celebrations are the ones in Mosta and Victoria – both have boisterous and well attended band marches. 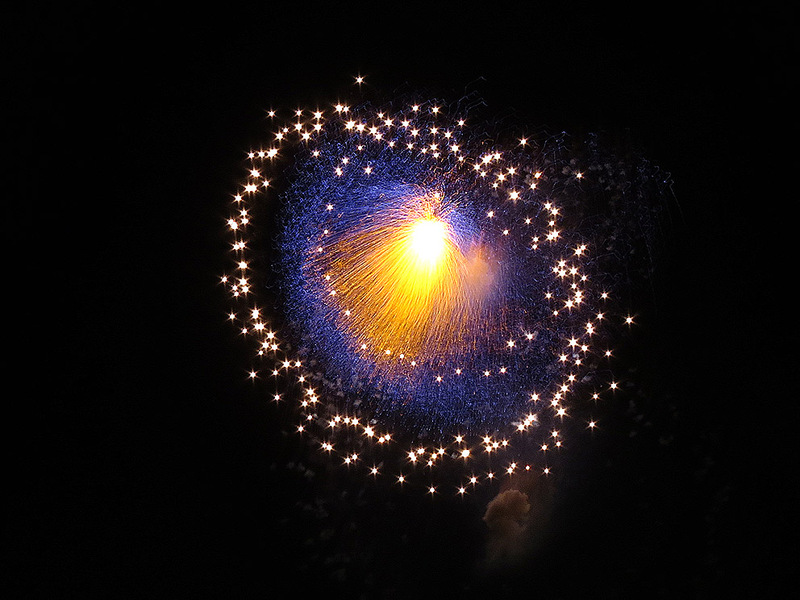 For fireworks head for Mqabba or Qrendi on the eve of the feast – both put up spectacular synchronised fireworks shows. Dingli and Mgarr also celebrate Santa Maria – but do it a week later. A curious feature of the Mgarr feast is an auction which is held at midday on the feast day where groups of parishioners bid for the honour to carry Our Lady’s statue in the evening’s procession. 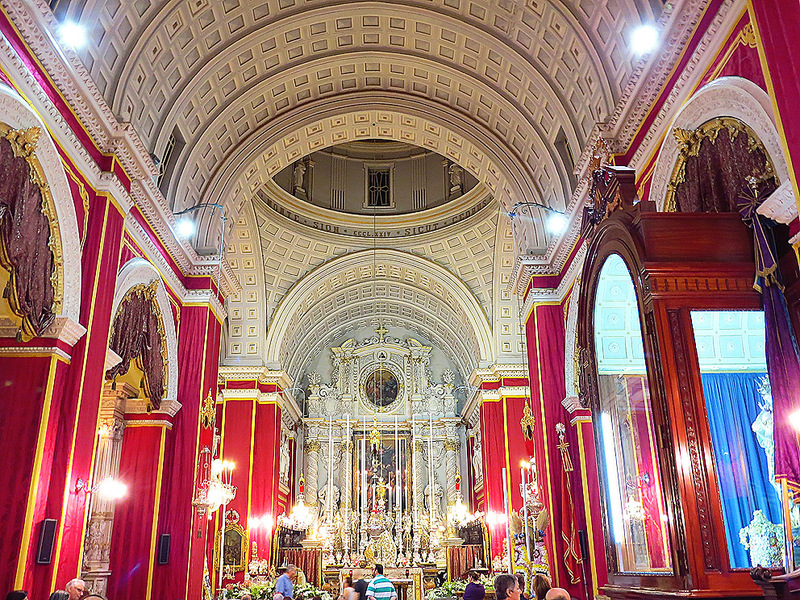 The month closes off with the Feast of Saint Helen in Birkirkara. Uniquely among Maltese feasts Birkirkara does not hold its procession in the evening but on the morning when Saint Helen’s statue emerges from the beautiful basilica at 8am sharp. 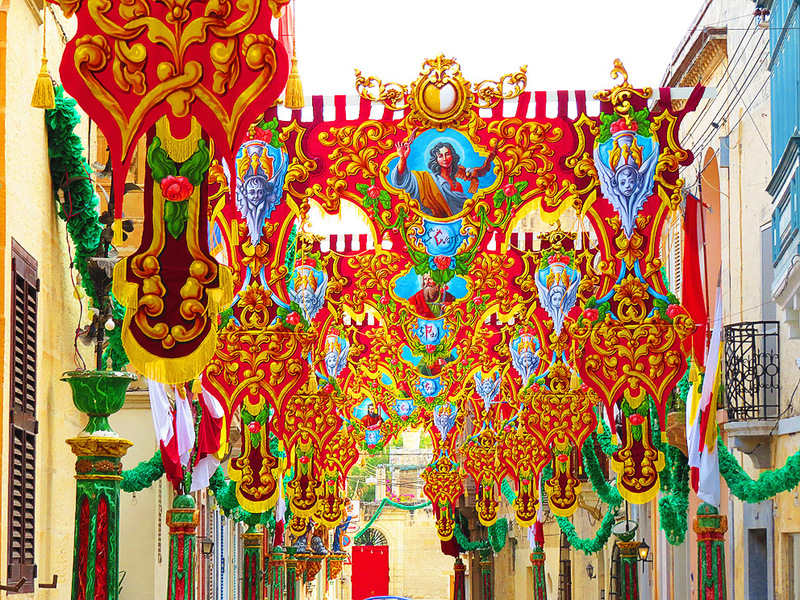 Birkirkara’s is one of the showiest processions on the island – one of the most solemn too. Birkirkara’s beautiful Main Street provides the perfect backdrop for this procession since it is one of the most beautifully decorated streets in Malta. Happy feasting – or as we say here “Il-Festa t-tajba”!